Our popular C110 Micro player is a great balance in price and capabilities. 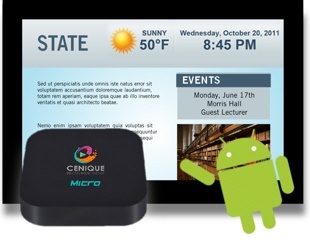 This solution pumps up the volume with 1080P resolution for high quality presentations on any size display, with landscape and portrait orientations. The C110 Micro comes with integrated Wi-Fi and LAN port for easy connectivity with a wireless or wired internet connection. So start displaying your custom Rise Vision content today. We'll set you up with great pricing and a fully featured, plug-n-play Rise Vision media player that happens to ship next day and comes with 30 days of free support for new accounts. It doesn't get much easier than that!